Apparently, I first made this recipe in September 2007 — I’m an historian, so I do tend to date all my notes. I never really finished it, though. Like so many things, I made it once, liked it enough to sketch down sorta kinda what I did and what I threw into the pot, and never looked back at it. But this is why good notes are important right? For this time of year, when “cool” feels “cold” because of transitions in temperature, a nice soup with warming spices might be the most perfect dinner. Also, the house smells amazing. As a finishing note, I add coconut milk, just a bit, to give it a richer, creamier curry flavor, though this is not necessary. I am reasonably sure that most non-dairy milks would work here, though I’m not sure rice milk would add much (and don’t use “light” coconut milk — it adds very little). But I think it’s fine without the added non-dairy milk, too. Because of the optional coconut milk, I’ve confusingly tagged this with a “tree nut warning” as well as “nut-free.” It depends on how you make it; do what works for you. 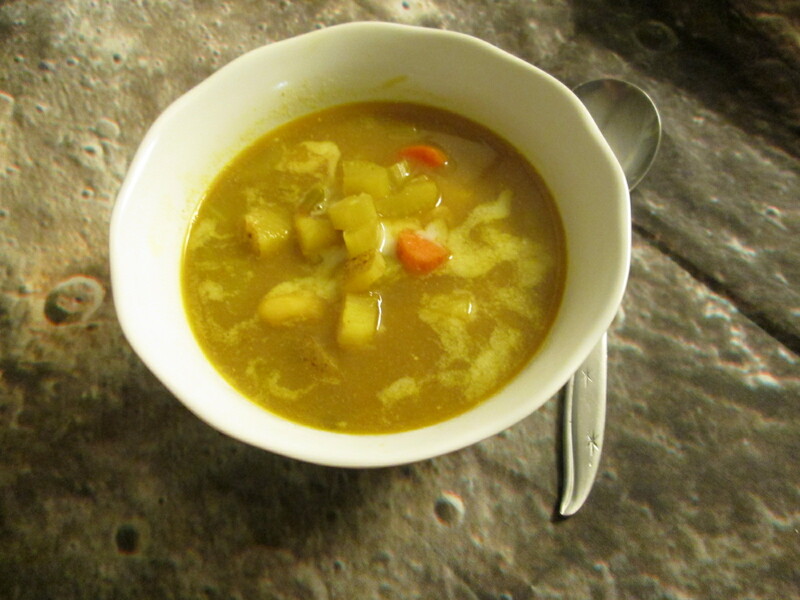 I basically took my forever-perfect combination for soup (onions, potatoes, carrots, celery) and changed up the seasonings to a mad fantastic curry blend. 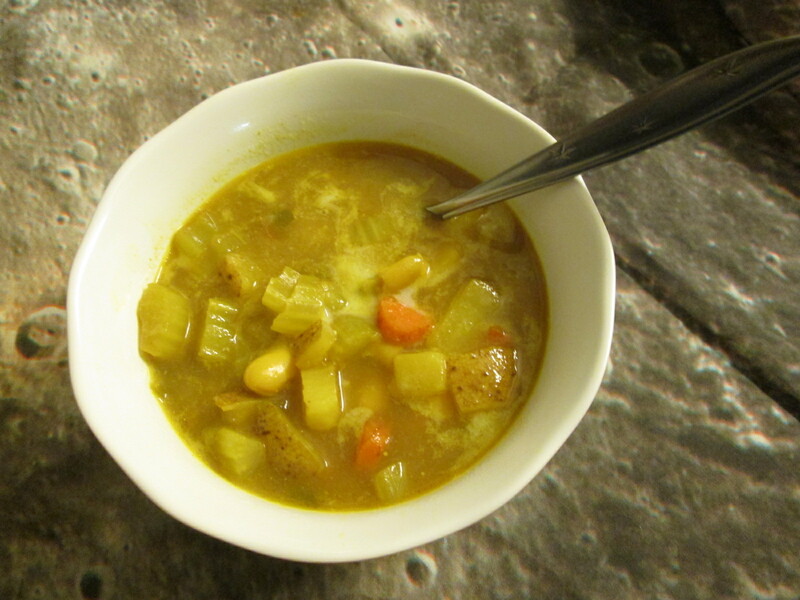 The spice of this soup stays mainly in the broth, which is a nice play against the earthy vegetables and beans. When you taste it to adjust seasonings, taste the broth AND a potato or carrot; they balance. Because this is a big pot, mix it up as you work through the leftovers. A handful of spinach added before re-heating is pretty awesome. I’ve also used a serving, with lots of broth, poured over fish and simmered until the fish is done. I like to get a little creative with leftovers. 3 medium potatoes, small cubed (smaller than dice, about 3 1/2 cups). If you want a super creamy soup, peel your potatoes. If you’re lazy like me, or want the fiber, leave the skins on. It’s up to you. Heat a large stock pot over medium heat. Add oil to your stock pot for a good thick coat (hence the range), and let that heat until shimmery. Add your onion and cook until translucent. Add the ginger and garlic, stir well, and cook until fragrant. Add about 1/4 of a cup of broth and stir well, making sure to scrape up any of the garlic and ginger that stuck to the bottom. Add the pepper, celery, and carrots, stir well, and cook for 5 minutes or so. Add potatoes, stir until completely coated with spices, then add the beans and stir again. Add the rest of the broth, covering your soup ingredients completely, stir well, and cover until it comes to a boil. Do this over medium heat. When you’ve reached the boil, turn the heat down to low and simmer until the potatoes are fully cooked and starting to break down a little — about 30 minutes. Stir soup well, and taste. Add salt, if needed, and then add the coconut milk, if using (or use another non-dairy milk here) and hot sauce if everyone wants it. If you do like it really spicy, I’d recommend harissa here. Enjoy. This soup reheats fantastically, but I’ve never frozen it.